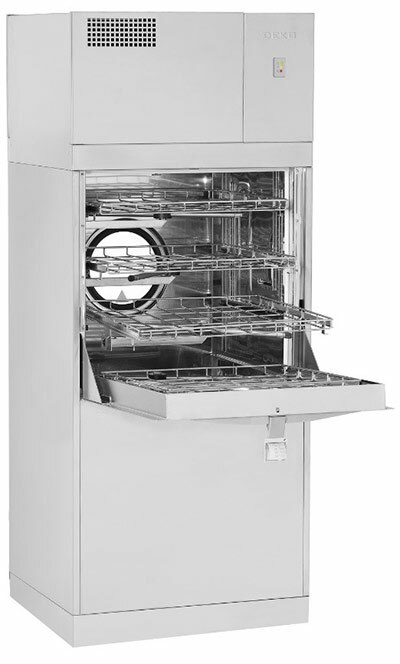 The Deko 2000 is an economical large volume, single chamber washer-disinfector-dryer, purpose-built for health care and laboratory sectors. The individually removable and retractable wash shelves facilitate the easy utilisation of the large chamber for load items of different height. The overall size is most space-saving but installation and service-friendly. With the width of only 800 mm, depth of 710 mm and height of 1970 mm the DEKO 2000 has ultimately one of the most efficient footprint usage to capacity ratio of all units on the world market. Unnecessary trolleys needing attention and extra processing, may also be avoided for safer floor clearance and ease of cleaning. Thanks to the optimized water volume, the use of water per phase is remarkable - only 5 gallons (19 litres) per fill !